Colress: I simply despise you, Ghetsis. That's enough reason for me! Please refrain from adding spoiler markup to Moments subpages. Read with caution! No! There is no running from Ultra Necrozma! Necrozma wins a fight against Solgaleo/Lunala within around fifteen seconds. Statwise both are stronger and Lunala has even type advantage against its Psychic typing (though Prism Armor mitigates that a bit), yet they are no match for it. It then proceeds to assimilate them to create its Dawn Wings/Dusk Mane form and fight you. Admittedly Necrozma is much older and more experienced than this particular Solgaleo/Lunala. So you've finally tracked the Nebby/Necrozma fusion to Ultra Megalopolis and climbed Megalo Tower to confront it, only to see it seemingly absorbing energy. It then extracts a core-like object from its own forehead and uses it to transform into a GIANT LIGHT DRAGON that then proceeds to fight you. The battle that ensues is easily one of the most epic fights in the game, with you and your team facing down the ungodly powerful Ultra Necrozma, all while this music plays. 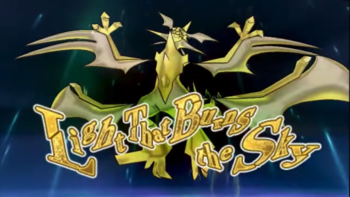 On the subject of Ultra Necrozma, its Z-Move, "Light that Burns the Sky," looks like something ripped straight out of Dragon Ball Z or Ultra Series. In short, it has 52 seconds of Necrozma draining the light from all its surroundings to power a giant energy ball that it uses to straight up NUKE its opponent. To make things even better, the move is so powerful that the player character is physically drained after giving Necrozma the Z-power to use it. The first hint that Lillie has taken a level in badass during the Team Rainbow Rocket arc is when she goes ahead and takes on a Rainbow Rocket Grunt by herself. Not only that, she apparently wins. When Faba reveals himself to be a traitor who sold out Aether Foundation to Team Rainbow Rocket he and another Aether Foundation employee challenge you to a fight, no-one else comes to your aid in the fight other than Lillie! True, her only Pokémon is a Clefairy, but its level 60 and comes packing a lot of support moves to help you out. It also surprisingly takes hits like a tank, despite not being evolved, so it will have a lot of time to set up Reflect and Light Screen to defend your Pokémon while they attack at their leisure. After you & Lillie thrash Faba and enter the castle, a pair of Rainbow Rocket Grunts ambush the two of you, and Lillie loses her nerve. It looks like you and she are in serious trouble... but then, a familiar theme starts, and a certain voice rings out. Could it be? It is! It's YA BOI GUZMA! He then joins you in Double-Battling the RR Grunts, revealing that now he has a team of Bug-types that are strong and versatile enough to be at Elite Four level of power! He continues to help you after that, at one point effortlessly holding back a pair of RR Grunts in hilarious fashion. So you've defeated Giovanni after he explained what he was aiming to achieve: an army of Ultra Beasts at his side. You face him, and you must defeat his best Pokemon, a Mewtwo that can Mega Evolve. What happens when you beat him? He accepts it as nothing more than a setback. He leaves without complaining, without a threat, nothing but a mutual respect for the trainer who has defeated him. Right before the credits roll, we see one last scene of Giovanni watching the heroes celebrate, only for him to say, "Now, what new world can I unleash my evil scheme upon...?" and teleports away. Giovanni didn't really lose, he's just moving his plan somewhere else. After defeating the Elite Four, it's not Kukui who winds up challenging the Player Character to become Alola's first Pokemon Champion, but Hau. Unlike the first game, Hau now finally has a full team of six Pokemon and this means that he did finally manage to complete the Island Challenge before the post-game, unlike in the original. To take it a step further, during future title defenses, Hau's team is even slightly higher leveled than both Gladion and Kukui, showing just how far he's grown as as trainer. After Guzma's redemption, you can go to his old house on Route 2, and find Guzma stopped by to visit his old man. He plucked up the courage to face his father in a Pokemon battle and win. The poor boy's probably feeling a lot better about his past now that he's made a new future for himself. In the originals, we have a scene where the Kahunas fought the Ultra Beasts together with the respective Island Tapus off-screen. But here, we get to see the other Kahunas at the Ruins facing the Ultra Beasts themselves before the scenes switched out to an Offscreen Moment of Awesome. Not only that, Hau isn't left out of the climax of the game this time around, as he fought with Tapu Koko against the Ultra Beast that appeared in front of them! Nanu is facing off against Guzzlord, which he once saw eat a person, thus causing his present-day apathy and tired attitude. He faces it down with a shrug. When Ghetsis threatens to kill Lillie if the player doesn't throw away their Pokéballs, he notices that they're shaking furiously. You've seen Pokémon happily taking part in battles and other events, but it would seem that Ghetsis in particular has a thing about driving both humans and Pokémon to pure fury, especially when he threatens to kill a dear friend that your Pokémon have bonded with over the course of the story. Also counts as Heartwarming. Lusamine gets one herself when she discovers Faba's treachery. She just gives a simple Death Glare while very calmly saying his name formally, that contains enough anger to actually scare Faba into running away. Since she's a genuinely nicer person than she was in the original games, it's Beware the Nice Ones at its most awesome. It's one thing in the Pokemon games for the player, usually a mere 10 or 11-year-old trainer that had started their journey not long ago, to defeat the major villain, who happens to be leader of the most dangerous criminal organization in their region, perhaps two, depending on the game. It is something on a whole different level for Pokemon games that the player in Ultra Sun and Ultra Moon to defeat eight major villainsnote In chronological order: Guzma, Lusamine, Archie and Maxie, Cyrus and Lysandre, Ghetsis and finally Giovanni in their journey, six of them in a very short succession (and while each of the latter six have a Legendary Pokemon in their teams, no less). And just like in Sun and Moon, this player also happens to be able to challenge and defeat three Pokemon Championsnote Red, Blue and Cynthia. The Ultra Sun and Ultra Moon protagonist's accomplishments make them a One-Man Army at worst. This game gives us another reason why Arcanine is known as the Legendary Pokemon: A single Arcanine and its general were able to conquer an entire country! The fact that every single evil team leader from the previous games make their triumphant comeback! Even better, after twenty plus years, Giovanni, the original Boss, finally gets his own theme. If you're someone who likes to transfer your old teams from previous generations, then there's something very satisfying about beating each leader with any one of the Pokemon you defeated them with the first time around. All of the non-mythical legendaries are available to be caught. As exciting of the idea of future Pokémon games on the Nintendo Switch sound; Word of God has confirmed that Ultra Sun and Ultra Moon are the final Pokémon games for the Nintendo 3DS, and with Game Freak working on both Pokémon Let's Go, Pikachu! and Let's Go, Eevee! and a new core title for the Nintendo Switch, marks the end of the game's time on Nintendo's portable family, which would likely not have made it as far without this series.